Did you see the latest from the Facebook News Room? If you didn’t, don’t beat yourself up – there is seemingly a new change every week and we are on top of it for you! Since they say “initially” (meaning they might just broaden this penalty), we recommend keeping these types of posts to a minimum. So… here’s the funny part. When something is extremely popular, it goes viral, and more people tend to share it. Share it a lot. BUT now Facebook would rather you not see quite so much of that sort of content. You know, you might lose brain cells. Instead, maybe they would rather you go watch TV or play a few more minutes of Candy Crush Saga. Since it’s a little hard to know exactly which popular content will be “de-emphasized” by Zuck and friends, we recommend keeping your content (relatively) unique. Spammy links are defined by Facebook as using, “inaccurate language or formatting to try and trick people into clicking through to a website that contains only ads or a combination of frequently circulated content and ads.” So you might think you are being taken to a fabulous beauty site with tips on must try lipstick shades for spring, but instead you are directed to some weird discount travel website. 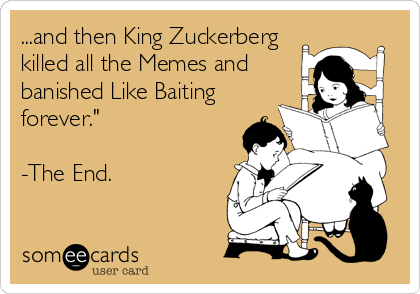 The bad news, in our opinion, is the same as usual — we have no idea HOW Facebook intends to “de-emphasize” the content! Will non-spammy links that use a link shortener for tracking and analytics purposes (like we use here at CSM) be considered in some way spammy in their eyes? Can you ever ask for people to “share” a post without being penalized? Can you upload this and still get away with it? In Facebook’s typical style of keeping the News Feed Algorithm close to the vest, we don’t really know the answers at this point. What recommend that you do is continue to look at the insights on a per post basis (which we do for all our clients) to see how certain posts are faring with reach, engagement, etc. and adjust accordingly. So we’ll have to see… Please let us know if you have any insights as you see this latest change rolled out. We’d love to hear from you! Don’t rely on any one source for all of your marketing. Yes that may seem trite and oversimplified, but really – there has to be a strategy in place that takes a holistic view on client acquisition and retention. Make sure you are consistently putting out good, quality content that’s relevant to your readers. Now, have we posted silly memes here and there for ourselves and our clients? The answer is yes, of course. Because Facebook’s algorithm rewarded engagement with a post (without as big of an emphasis on content) by making it appear to more of your fans’ news feeds (= more eyeballs). Said another way, the more likes, clicks, comments, and shares your post got (especially in the first few hours) the more frequently Facebook would serve it up to your fans. Therefore, posting content that was funny or a hot topic to generate a higher engagement rate was encouraged by Facebook. As the Salon.com article points out, it’s really no different from how SEO experts work on maximizing keywords to show up in search. Thoughts? We’d love to hear yours! Just add it to the comments below! * Click here to see a great article from Salon.com describing the issue.